Wabi-sabi is a traditional Japanese aesthetic that accepts transience and imperfection. It is one of beauty that is "imperfect, impermanent, and incomplete." The idea is that being surrounded by natural, changing, unique objects helps us connect with our real world and escape potentially stressful distractions. 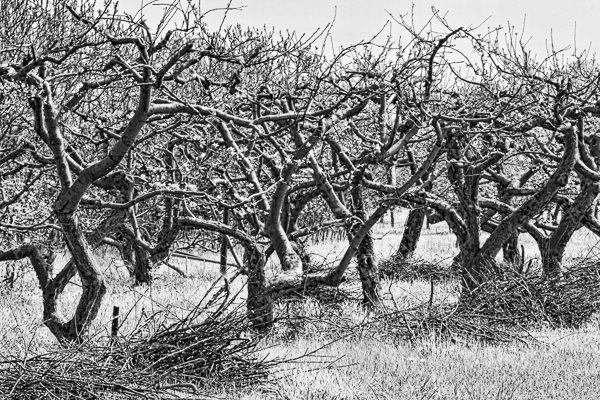 So I'm not sure if this orchard is a wabi-wabi orchard or one of neglect and decline. 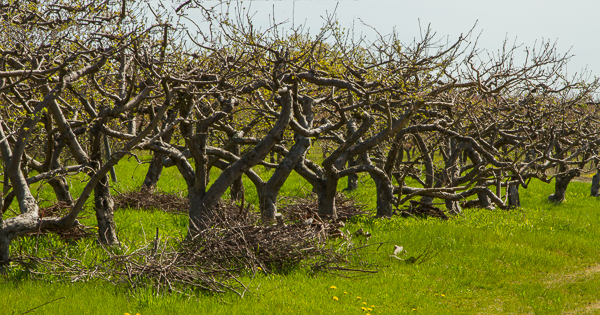 The bundles show the orchard has been trimmed, but the strange contorted shapes of trunks and branches reveal another view or orchards. Marcel Theroux's BBC Series "In Search of Wabi Sabi" covered this topic. He traveled throughout Japan in 2009 trying to understand the aesthetic tastes of its people, beginning by comically enacting a challenge from the book Living Wabi Sabi by Taro Gold to "ask people on a Tokyo street to describe Wabi Sabi." Theroux showed that, just as Gold predicted, "they will likely give you a polite shrug and explain that Wabi Sabi is simply unexplainable." Wabi-sabi says that imperfect gives something greater meditative value, and that seems to me to be the case with this orchard. The beautiful orchards shower us with delight, we linger, enjoy and then we move on. This one, on the corner of North Service Road and Durham in Beamsville, is far more demanding.